Welcome back. In honor of Valentine’s Day a few years ago, I blogged about a study that examined how intimate kissing (aka French kissing) affects the mouth’s microbiome--the microbiota or microorganisms in a particular environment, such as our body or part thereof (Valentine Kisses). One key finding of tests with 21 couples encountered at a zoo was that the post-kiss composition of oral microbiomes was more similar between couples that were partners, living together, than between couples that were only on a date. It was recognized that the similarity of partners’ microbiota could be caused less by intimate kissing than by simply living together, sharing their environment. Valentine’s Day has passed, but there’s a study of much greater scope that left no doubt about the influence of environment. The study’s importance is attributed to its focus on gut microbiomes. The microorganisms each of us hosts in our digestive tract have a significant role in our health, a role that seems to grow with every investigation. Collaborating scientists led by researchers from Israel’s Weizmann Institute of Science assessed genetic and gut microbiome data obtained through blood and stool sampling of 1,046 healthy Israeli adults of different ancestries (e.g., Ashkenazi, North African, Yemenite, Sephardi). Dietary habits, lifestyle, medications as well as other measurements were also collected. Although genetics has been presented as a primary if not the primary influence on gut microbiome composition, the researchers’ analysis showed that gut microbiomes were not significantly associated with ancestry; genetics had only a minor role in determining microbiome composition. In contrast, their assessment of environmental factors found significant similarities in the microbiome compositions of genetically unrelated individuals who shared a household. Further, over 20% of the inter-person microbiome variability was associated with factors related to diet, medications and body measurements, such as BMI. To support their finding, the researchers examined gut microbiome data available from a 2016 study of 1,126 pairs of twins. 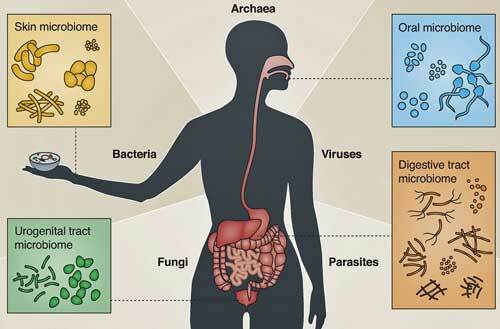 They found no more than about 8% of the microbiome was inherited. The investigation also compared the associations between both genetic and microbiome data and clinical measurements, such as cholesterol, weight and blood glucose levels. The strength of the links between the microbiome data and most clinical measures were at least as strong as those of the genetic data. Adding to the conclusion that environment--lifestyle and diet--not genetics are key drivers of gut microbiome composition is the study’s recognition that combining genetic, environmental and microbiome data improves the prediction accuracy for many human traits and health. While oral microbiomes, well, kissing, might have more going for it, gut microbiomes is clearly a more important subject for study. Thanks for stopping by.